It was up to 40 degrees yesterday in Minnesota, and it felt downright tropical! The snow was melting by the buckets...then today hit and it a chill filled the air. The temperatures dropped and the ice pellets fell. Why ice pellets? It is supposed to snow this time of year, not send down tiny hail! When I got to my car after work, I discovered that the ice had formed a thin, but rock hard, and immoveble layer of ice on my windows. I had no choice but to stand and scrape...and scrape, and scrape some more. It hardly budged, and as I was driving home trying to warm my fingers and see through the small holes I had scraped in the windows, I was dreaming of something warming I could ingest when I got home. Yes, I could make a hot cocoa, or maybe a hot toddy...but I wanted to be creative, and since it is New Year's Eve, I thought it would be a good night for something a bit more special. Bourbon sounded wonderful! I wanted to include bourbon since it warms you from the inside. I had this really good drink at Heartland Restaurant in St. Paul recently called the Cardinal's Kiss with bourbon, walnut liqueur, and bourbon soaked cherries which was delicious! I thought why not make my own twist on it, since I had some bourbon soaked cherries in my fridge. So I combined lemon and orange juice (so the drink would not be entirely booze, plus it gave it a nice citrus note), cherry soaking liquid, and a dash of almond extract (for a nutty flavor) with bourbon. It was warming, and like a warm kiss...everything that walking outdoors right now was not. The perfect drink to shake off the winter chill. If you are chilled, you should fix yourself one of these! Happy New Year everyone! 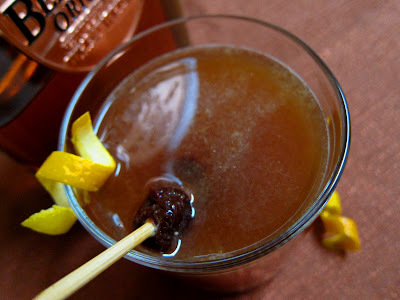 In a martini shaker add the ice, bourbon, cherry liquid, orange juice, lemon juice, and almond extract and place top on shaker. Shake until well blended. 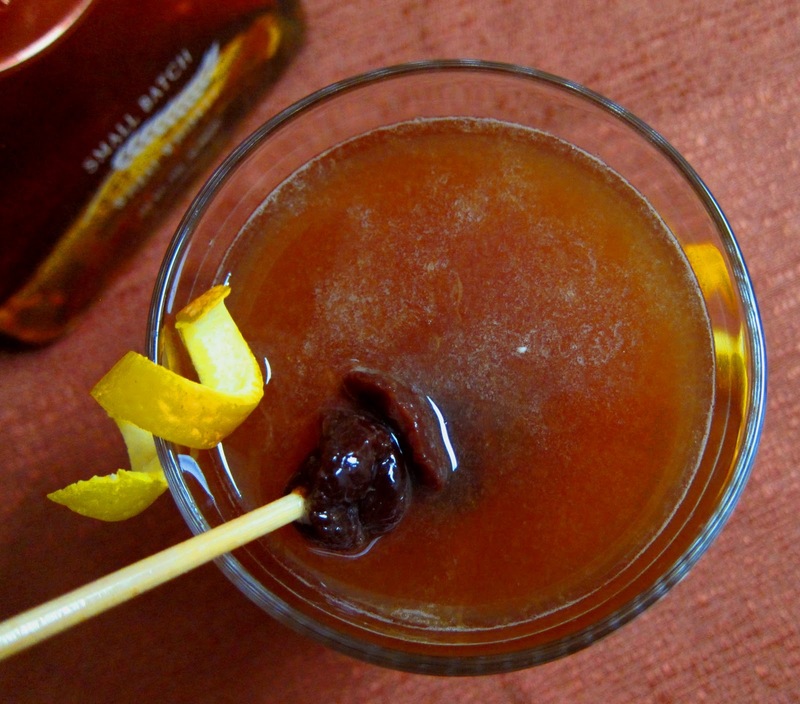 Place about 4-5 bourbon soaked cherries onto a skewer, and place in a lowball glass. Pour drink through a strainer into glass, and serve with a citrus zest garnish! In a glass jar, cover 1 cup dried bing cherries with enough bourbon to cover. Place lid on jar, and let sit at least overnight before using. Store in the fridge. I'm not a bourbon drinking but the thought of bourbon soaked cherries may convert me! Sounds like a fabulous cocktail! hey amy u give really nice name in this cocktail! really nice, happy new year. What a perfect warm you to your toes drink! Thank you for sharing this! Happy New Year! Lovely (as always)! You should open a cocktail bar with your recipes, they're so wonderful and creative! It was warmer outside today then in my store! I wanted to do cartwheels. 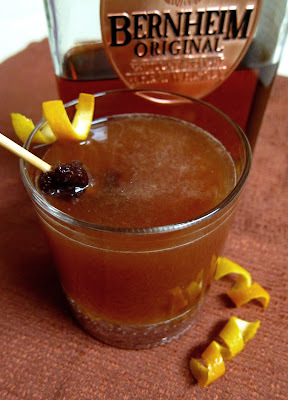 This drink sounds great :D I <3 bourbon. what a fun blog! now following you~ Happy New Year! I need to get around more - I've never even heard of walnut liqueur. This drink sounds like it would be very smooth. Thanks for sharing! lovely name. these liquers should be a terrific lot right? never got hold of one yet. Love this cocktail but then I am a Makers Mark fan! I see having this with your Festive Dark Chocolate Shortcake - YUM!